Posted in: Reviews. Tagged: Alissa White-Gluz, Charlotte Wessels, Delain, Moonbathers, The Human Contradiction. There was a time not so long ago when Delain was relegated to being a Dutch symphonic metal afterthought, regarded by the “experts” as a wannabe Within Temptation with a startling lack of balls and no identity. Unkind words indeed, which were eaten and subsequently choked on when the band unleashed The Human Contradiction in 2014. It didn’t merely open the door for Delain; it carved the band its own private entrance to the bigger leagues. So it goes that the follow-up, Moonbathers, was expected to fall just short of The Human Contradiction’s mark because, let’s face it, lightning doesn’t strike twice when a band is put under that kind of pressure. Like bloody hell it doesn’t. Having never bought into Delain’s keyboard-driven metal, The Human Contradiction was a wonderfully addictive surprise that flew in the face of my regular playlist (with the exception of Amaranthe). 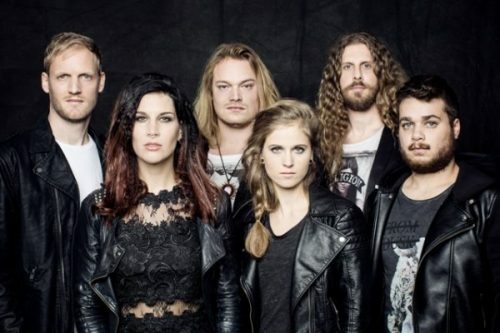 Perhaps it’s the freshness of the Moonbathers material, but the band has taken their songwriting and performances to a new level, particularly where vocalist Charlotte Wessels is concerned. The album grooves, bounces, croons and crushes its way through 11 tracks, displaying even more diversity than what The Human Contradiction brought to the table (which was considerable). “Hands Of Gold” featuring vocalist Alissa White-Gluz (Arch Enemy) – the only guest appearance on Moonbathers – is the perfect lead-in as a continuation to the previous record, with Wessels carrying the track through soaring melodies and gritty voice. First single “The Glory And The Scum” shows off a heavier, darker side to Delain that crops up time and again over Moonbathers’ course, contrasting sharply again the softer tracks like “Chrysalis – The Last Breath” and “The Hurricane”. The deeper you go the better the album gets, peaking with the three-point blast of “Fire With Fire” (fast and heavy), “Pendulum” (crushingly anthemic) and “Danse Macabre” (exceptional). It can’t be stressed enough that Wessels has come into her own as a singer, using her voice as a full-on instrument to bring a welcome new dimension to the Delain sound. The tribal chanting on “Danse Macabre” alone is a goosebump experience. As for the cover of Queen’s “Scandal”, the song is tailor made for Delain and guaranteed to become a live favourite. The only complaint about Moonbathers is the inclusion of “Suckerpunch” and “Turn The Lights Out”, which appeared on the Lunar Prelude EP earlier this year. Both songs fit the record and are solid tracks, but it would have been nice if Delain could have pulled even just one brand new song out of their rather potent well of creativity instead. The audience is indeed listening, after all, and they want more.